Few realize the cemetery they pass on Broadway Street is actually a collection of seven cemeteries built over the last 176 years. In that time, these cemeteries became the resting place for a menagerie of souls who bring a touch of mischief, mystique and the macabre to the Island's history. However, before the departed rise to tell their stories, you have to first understand just how much history is actually buried in these cemeteries. 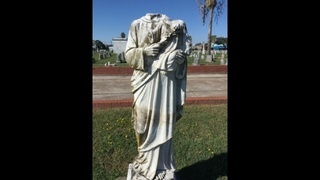 "The cemeteries have been raised two or three times in different areas, and when the stones were lost during the raisings, they just resold the plots and did another burial on top," said Kathleen Maca, author of "Galveston's Broadway Cemeteries." Maca said the last grave raising was in the 1920s. Maca said what mourners and passersby see on the surface is only the top of three layers of burials. Maca said there are an estimated 12,000 grave markers visible in the cemeteries, but that figure is believed to only be a quarter of the bodies buried off Broadway. "Do you think there is where the real history of Galveston is written?" asked Channel 2's Robert Arnold. "It's the one place that has survived in one shape or form through all the tragedies," said Maca. Maca said the city hosts volunteer days to help pry a few of the more elaborate monuments from the earth. However, some are too heavy to raise. One example is state Sen. Franklin Merriman's mausoleum. Only the roof is showing above ground; the rest of the structure remains buried. "I think one of the most surprising things is the buried monuments that we're walking on top of," said Maca. "People have no idea what's out here." That statement also includes the tales that ripple through a city of stone and granite, like that of the Alberti family buried in one of the oldest cemeteries. Among the names on the family's tombstone is Elize Roemer Alberti, who newspapers referred to as "the demented mother." In 1894 she murdered four of her children. "She called all of her children downstairs and gave them poison wine. One daughter did not hear her mother call; she survived," said Maca. Maca said a sixth child also ingested the poison, but recovered. Maca said Alberti was believed to have been suffering from postpartum depression. Maca said Alberti received treatment in an insane asylum in San Antonio, and she was brought back to Galveston. Alberti then committed suicide and was buried in the same plot as her children. "So one of the rare sights of a murderer actually being buried with her own victims?" asked Arnold. Then there is sordid account of Nicaragua Smith, who is said to be the only ghost that haunts the Broadway cemeteries. However, Smith's tombstone won't be found among the wavering blades of grass or divine sentinels. Maca said Smith was a burglar, arsonist and Confederate Army deserter who was executed by firing squad at his unmarked grave site on Jan. 8, 1863. Newspaper accounts record some of Smith's final words were, "Bury me face down." The newspaper refused to report the rest of Smith's final statement because it "concluded with an allusion to the Southern Confederacy which will not bear printing." "He got six bullets in him and a few in the coffin, and he fell into the coffin and they buried him where he laid," said Maca. Maca said Smith appears on the anniversary of his death when, if you listen closely, you can hear him cursing his executioners. Not all the souls who've passed through the cemeteries' gates have such sinister backgrounds. One of the most beloved figures was a gravedigger by the name of Newton Taylor. Before he died in 1905, Taylor dug hundreds of graves, attended the funeral services, pumped the organ bellows at Trinity Episcopal Church and performed magic tricks for school children, who called him "Uncle Newton." Maca said one of Taylor's signature accessories was a silk top hat, which he always wore to work. "One of the reasons was out of respect for whoever's grave he was digging and the other was he kept his chicken in it for lunch," said Maca.